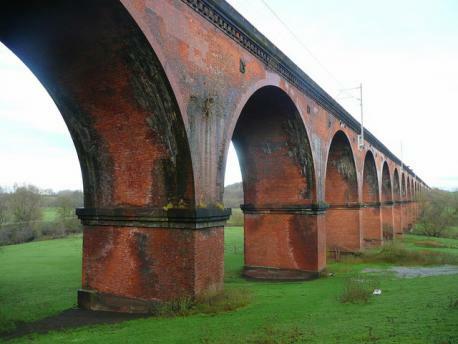 THE main trainline between Wilmslow and Crewe [including Goostrey and Holmes Chapel] is to be closed for 11 days from Saturday 13th February to Tuesday 23rd February while Network Rail make repairs to the viaduct. Replacement buses will operate between Stockport/Wilmslow/Alderley Edge & Crewe serving Goostrey, Holmes Chapel, and Chelford residents. Knutsford Guardian: ‘A bus will run between Crewe and Stockport calling at Wilmslow. On Saturday and Sunday, replacement buses will operate between Wilmslow and Macclesfield and from Monday to Friday between Wilmslow and Macclesfield or Crewe. Virgin Trains services between Manchester Piccadilly and London Euston will be diverted and unable to call at Wilmslow. Train services will also be unable to call at Stockport and Wilmslow. Northern Rail services between Manchester Piccadilly and Alderley Edge or Crewe (via Manchester Airport) will start from and terminate at Wilmslow or Alderley Edge and trains between Manchester Piccadilly and Crewe (via Stockport) will start from and terminate at Stockport or Alderley Edge. Services from Manchester Piccadilly to Stoke-on-Trent will depart earlier than normal, calling additionally at Levenshulme and Heaton Chapel. Trains from Stoke-on-Trent to Manchester Piccadilly will run as booked. Arriva Trains Wales services between Manchester Piccadilly and Cardiff Central/Carmarthen/Milford Haven, will be diverted via Warrington Bank Quay and will start from and terminate at Manchester Oxford Road. CrossCountry services between Manchester Piccadilly and Bristol Temple Meads or Bournemouth will be diverted via Macclesfield and Stoke-on-Trent not calling at Wilmslow or Crewe. #NPPF Review Drafting Cockup or Intended – A presumption in favour of building on village greenspace? So we have the first full scale- as opposed to endlessly adhoc (often through ‘guidance ‘ without consultation which the courts naturally took a dim view of) nothing do do with evidence of what is or is not working bit rather driven by the productivity plan and Housing Bill. Much of the document seems back to PPG3, housing around transport hubs, more promotion of bropwnfield, more proactive on new settlements. The introduction of a large number of changes due to starter homes is here as well as relaxing policy on previously developed brownfield sites. Bunbury’s Neighbourhood Plan has successfully passed a key milestone on its way to helping protect the community from unplanned and unsustainable development. The plan has been given the green light by a planning examiner. Bunbury Parish Council was one of the first in Cheshire East to take up the new neighbourhood planning powers and, following a public hearing, the examiner has declared the Bunbury Neighbourhood Plan meets and passes all the relevant tests. This means that, subject to some modifications, the plan can now move forward to a local referendum, where the residents of Bunbury can vote on it. If the referendum is successful, the policies in the plan will be brought into full effect and used when Cheshire East Council considers planning applications in Bunbury parish. Cheshire East evidence has ‘significant’ implications for local plan. The Government inspector overseeing Cheshire East’s local plan has published his views on the latest evidence put forward by the council, which increases the amount of homes and employment land the borough will deliver by 2030. The examination into the plan was suspended by inspector Stephen Pratt last year to allow further work to be carried out on key evidence areas. Pratt previously outlined “serious shortcomings with the council’s objective assessment of housing need and future provision”. The local plan initially proposed a minimum of 27,000 houses between 2010 and 2030, averaging 1,350 homes a year. According to the revised evidence base, the council has increased the number of dwellings by 33% to 36,000 by 2030, and has increased the requirement for new jobs from 13,900 to 31,400 on 930-acres of land. Following the submission of additional evidence at the end of the summer, a series of public hearings took place in October. In his interim views issued to the council, Pratt said that the council “has produced an impressive and comprehensive set of additional evidence within a relatively limited amount of time during the suspension of the examination”. However, he stressed that the evidence has “significant and wide-ranging implications for the submitted local plan”. He said: “Cheshire East Council would undoubtedly wish me to fully endorse the key elements and conclusions of the additional evidence produced during the suspension of the examination. However, this is not possible for several reasons”. Brereton has successfully passed a key milestone after their draft Neighbourhood Plan (the first in Cheshire East) has been passed by the Planning Examiner, but with no Local Plan or 5 year Housing Supply it will be interesting to see how effective it will be in resisting unwanted development. Brereton’s Neighbourhood Plan has successfully passed a key milestone on its way to helping protect the community from unplanned and unsustainable development. The plan has been given the green light by a planning examiner. Brereton Parish Council was the first in Cheshire East to take up the new neighbourhood planning powers and, following a public hearing, the examiner has declared the Brereton Neighbourhood Plan meets and passes all the relevant tests. This means that, subject to some modifications, the plan can now move forward to a local referendum, where the residents of Brereton can vote on it. “This is a fantastic achievement for the parish council and the neighbourhood plan steering group and I’d like to congratulate everyone involved on all the hard work that’s been put in to reach this point. Neighbourhood plans enable local people to develop policies to address those planning matters that affect not only their interests but also their wellbeing. They allow communities to take ownership of planning policy, which directly impacts on their lives. The plan contains a number of policies specifically designed to shape development in Brereton, including policies on local design, landscape and scale of development. The community has been brought into the plan-making process from the very beginning and, over the past three years, has designed a plan that is unique to Brereton and seeks to shape development to benefit the community. A referendum is anticipated in the coming spring. If the plan is backed, the policies in the Brereton Neighbourhood Plan will then be given their full weight in deciding planning applications. It is encouraging when a developer acknowledges the influence of Jodrell Bank Telescope on planning applications for new houses in the village. A new application 15/5517C has been posted for 2 houses on the land between 51 and 61 Main Road. Originally three larger houses were approved on this site, when JBO did not raise any objections as long as screening protection was provided. Then a second application for seven houses instead was refused where JBO said it would cause unacceptable interference. From JBO’s previous comments we understand it is the cumulative impact of additional housing that is a key consideration so JBO may still object to this application for two houses, as there is still the potential 119 houses at Shearbook to contend with. It will be interesting to see their response. Let’s hope other developers with interest in the village take notice and revise their plans accordingly, allowing a slower more sustainable growth of the village that wouldn’t impact on JBO’ s research and would be more in line with the villagers’ needs and wishes. Apparently Micheal Jones has resigned as Leader of Cheshire East Council following questions over contracts, with a statement expected tomorrow.